You likely have fond memories of family trips. You remember your parents packing provisions, stuffing suitcases and loading everyone up in the car. While, as a kid, what you knew was that you had an unforgettable summer vacation, as a parent, you have probably realized those trips must have been hours of work in the planning and tons of tedium in the execution. Upon further reflection, you might even remember some of the less pleasant parts—bickering, endless hours of nothing to do, bickering (again), weird food, bickering (some more) and strange smelling hotel rooms, tents or relative’s houses—that the tricks of memory had allowed you to gloss over. Well, summer is here again and it’s your turn to create memories for your children to cherish and occasionally grimace over. You can use your own memories, your experience and knowledge of your children, and a few of these ideas to make the trip a little easier and even a little more enjoyable for everyone. First, it’s worth remembering that travel is hard. Some of us, adults and children, seem to handle it with grace and aplomb. Most benefit from a gentle acknowledgement that we’re at least trying to be gracious and flexible, and there are those few who will just be miserable every second they’re away from home. Whichever category you and your children fall in, try to remember that everyone is probably putting their best effort forward. If the adults can be calm and at least fake certainty during the vagaries of travel, children will usually try to follow suit. Second, travel is an excellent time for compromises to ease the pain and boredom of a long day in the car or through airports, like all those almost foods you never let your children have. In our family, we carry box cereal on our 2000 mile trek to visit family. Fruit leather is doled out between lunch and breakfast, and there might be individual packages of chips or snack crackers with lunch. Milk shakes are another thing my children consider to be road food; we have these after dinner when I’m hoping everyone will doze off and I can get two more hours of driving done before we have to stop. Travel is so weirdly unnatural that these foods are indulgences that do not slip into habit when we’re back into our routine. And, these foods mark time during a grueling road trip for children who cannot grasp what “2000 miles” really means. Everyone remembers playing driving games, so have a few up your sleeve that you can pull out. There are the old classics like variations on finding every letter of the alphabet in billboards and other road signs, to collecting license plates from as many states as you can (with your eyes as cars pass by, not at rest stops with a screwdriver!). You can also make up your own games to fit the ages and interests of your children. We played a game called “Guess an Animal”. It’s pretty much like 20 questions and a great way to introduce words like “vertebrate” and “mammal”, but it’s also just fun. We’ve been able to play it with children as young as 3, but we’ve found that even older children will play a round or two with a younger sibling as long as everyone (yes, parents too) is willing to participate. For older children, especially teens and adults, we’ve invented a new game called “Song Theme”. We use an MP3 player and pass it around. The first person picks a song. The second person chooses a song based on something in the first song, then everyone tries to guess how the songs are linked. This is a time for everyone to really listen to each other’s music choices, and the puzzle aspect can be pretty enthralling. If you have an MP3 player, one person can also be DJ for the other passengers, which guarantees everyone gets a chance to choose what to listen to. Singing is a tried and true way to spend a pleasant hour or two in a car. 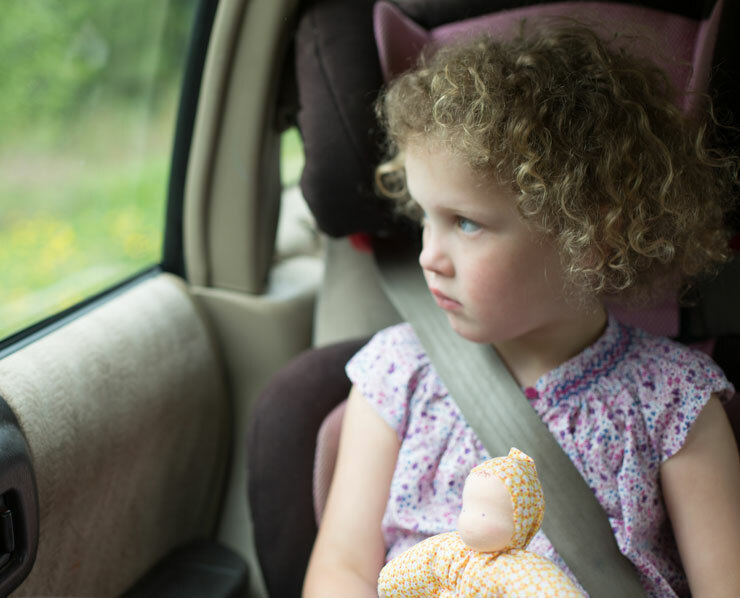 When our children were really young, they pretty much cried every second they were buckled in carseats. The exception to this was that our singing could get them to stop. You can bet we sung ourselves hoarse a few times. Now that they’re older, they like to sing along. We sing everything from Pete Seeger’s “John Henry” to GNR’s “Sweet Child o’ Mine”. You’ll find it’s amazing how hard it is for them to bicker when they’re busy singing. Finally, find your own tricks. You know your children best, and you can find ways to make the endless hours of travel more bearable. Remind yourself that even the “bad” parts usually make a good story.